Grackle Tooth are one of my all time favorite races; being big, Southern mannered reptiles with a passion for heavy weapons and blowing things up pretty much made them reigning champs in that arena for awhile. I’ve played one before (nothing like this fella, except for a mutual love of grenades and rail guns), and some of my most memorable gaming moments were a result of that. I really got into writing him – you might be able to tell by the style and wording, quite a bit of his mannerisms were projected onto the write up! 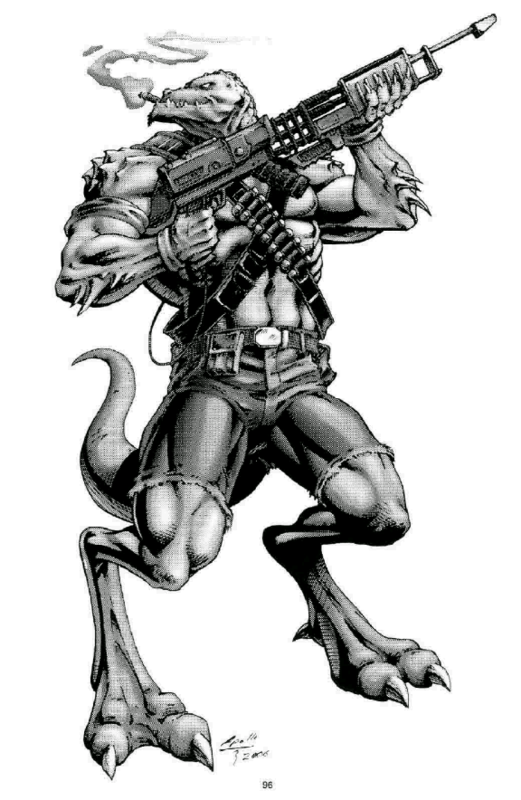 I hope you enjoy another take on the “badass lizard warrior” character type. Trigger Warnings: Alcoholism and child abuse. Recommended Setting: Any starting adventuring group who could use a gunner with a fondness for explosives that can also punch like a tank. Not recommended for pro-CS campaigns. Would do well as part of a mercenary or rescue group. Horror/Awe Factor: 12; good or bad, Grackle Tooth are mighty impressive.